Vivid Sydney is back for its 11th year, lighting up the city from Friday 24 May to Saturday 15 June, 2019. The festival will once again host a wide range of events, including light shows, talks, workshops, forums and live music. This year’s Light Walk will see over 50 radiant works curated into what Vivid claims is the largest outdoor gallery of its kind in the Southern Hemisphere, stretching for over three kilometres. Argyle Cut will return to the festival this year, where Academy Award winning Pixar Animation Studios will light up Sydney’s heritage-listed Argyle Cut tunnel in The Rocks with a visual feast of behind-the-scenes artwork and the evolution of iconic animation. For the much-anticipated Lighting of the Sails, Los Angeles-based Chinese American artist-filmmaker Andrew Thomas Huang will present Austral Flora Ballet; a hypnotic tribute to Australia’s native plants and flowers. 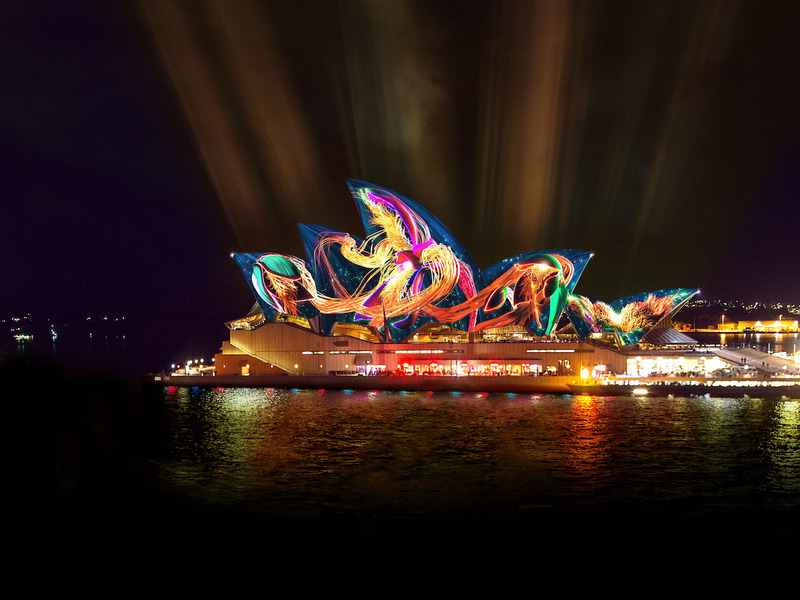 The light show will incorporate a dancer’s movements in response to the sensuous arcs of the Sydney Opera House’s silhouette. Visitors will once again be able to weave through the Royal Botanic Garden Sydney for close encounters with illuminated artworks that reflect and refract both light and nature. Glowing, darting, hovering above the ground, Firefly Field is a mesmerising installation of 500 flying light points that simulate the aerial ballet of these tiny nocturnal lampyridae. Popular precincts Taronga Zoo, Darling Harbour, Chatswood, Barangaroo and Luna Park will also light up in 2019. A new addition to this year’s festival is Vivid School, aimed at high school students in years 9-12. Students will have the opportunity to learn more about the creative processes involved in imagining, designing and delivering light-based artworks for a significant global event. “This initiative will enable students and their teachers to meet the professionals behind Vivid Sydney’s iconic building projections and light walk installations, and to hear from artists, designers and technicians about their career paths and how they harnessed opportunities to build their skills for future projects and employment,” says Sandra Chipchase, Destination NSW CEO and executive producer.